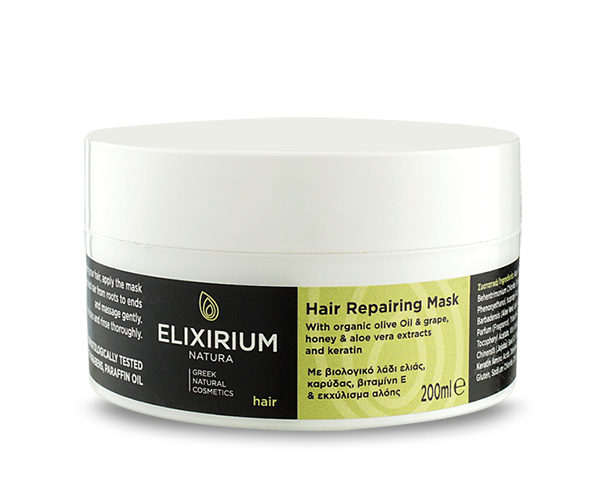 ELIXIRIUM NATURA - HAIR REPAIRING MASK. 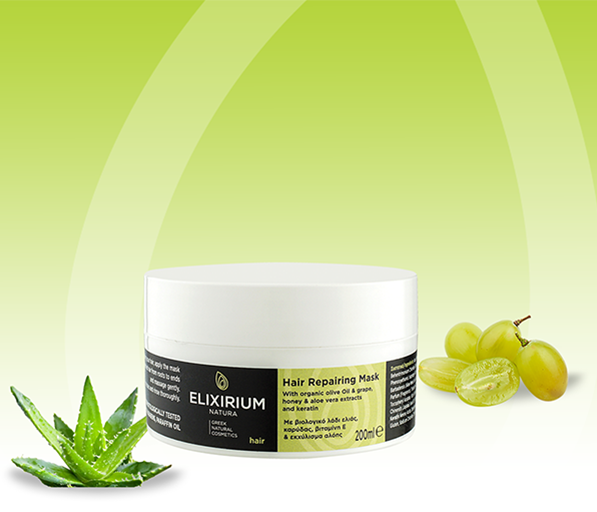 HomeElixirium NaturaHAIRELIXIRIUM NATURA - HAIR REPAIRING MASK. With organic olive Oil & grape, honey & aloe vera extracts and keratin. FREE OF PARABENS, PROPYLENE GLYCOL, PARAFFIN OIL. Hair mask with organic olive oil, grape seed oil, aloe & honey extracts, provitamin B5, wheat protein, keratin and vitamin E that moisturizes and nourishes the hair leaving it soft, healthy and shiny.Suitable for damaged, dry and colored hair. Use: After washing your hair, apply the mask to towel dried hair from roots to ends and massage gently. Leave for 5-10 minutes and rinse thoroughly. Ingredients : Aqua, Cetyl Alcohol, Behentrimonium Chloride, Glycerin, Amodimethicone, Phenoxyethanol, Isopropyl Alcohol, Cetrimonium Chloride, Aloe Barbadensis (Aloe Vera) Leaf Juice, Olea Europaea (Olive) Fruit Oil, Parfum (Fragrance), Trideceth-12, Panthenol, Benzyl Alcohol, Tocopheryl Acetate, Vitis Vinifera (Grape) Seed Oil, Simmondsia Chinensis (Jojoba) Seed Oil, Benzoic Acid, Mel (Honey) Extract, Keratin Amino Acids, Dehydroacetic Acid, Hydrolyzed Wheat Gluten, Sodium Chloride, Citric Acid, Lilial, Hexyl Cinnamal.